We can create beautiful wall stickers from your company logo or images. Often used to decorate entrances or reception areas, our self adhesive wall stickers stick to any smooth surface (including glass) and are easy to apply. Printed at high resolution with light-fast and waterproof inks or cut from robust coloured vinyl they look fantastic and will last for years. Just tell us what size you want the final wall sticker to be and upload your logo and / or image(s). Please provide artwork to scale at 150 - 300DPI with at least 3mm bleed and crop marks and all fonts outlined. We require CMYK artwork. RGB files and spot colours, including Pantones, may not convert to CMYK as you expect. Accepted file types: jpg, jpeg, tif, tiff, pdf, ai, eps, psd, indd, zip, rar, tar, gz. I confirm I am supplying print-ready artwork to scale at a minimum of 150DPI with bleed, all fonts outlined and in a suitable file that is CMYK formatted and contains no spot colours. Otherwise I accept that there may be differences between the artwork I supply and the final print I receive. Choose "yes please" if you would like us to email you a proof of your artwork after we have converted it for our print process. Please note, email proofs are for layout, not for colour. Give us an outline of the artwork you would like us to produce. Call us on 01579 340985 if you have any queries. We will email you a proof before printing. If you need to upload any files that better explain your brief or any components like logos, please do so here. JPEG, TIFF, PDF, AI, EPS, PSD, INDD, Word Docs or Excel Spreadsheets accepted. Accepted file types: jpg, jpeg, tif, tiff, png, gif, giff, pdf, doc, docx, xls, xlsx, ai, eps, psd, indd, pages, numbers, zip, rar, tar, gz. We can create beautiful wall stickers from your company logo or images. Often used to decorate entrances or reception areas, our self adhesive wall stickers stick to any smooth surface (including glass) and are easy to apply. Printed at high resolution with light-fast and waterproof inks or cut from robust, matt finish coloured vinyl they look fantastic and will last for years. We produce wall stickers either as fully printed vinyl with an adhesive backing (which will then be contour cut) or as “cut vinyl”. A cut vinyl wall sticker is produced from rolls of coloured vinyl. The design is cut out of the material and the waste parts removed (like the lettering on a sign-written van). Cut vinyls are best for designs made up of flat areas of discrete colours – they’re especially good for logos. If the design includes graduations of colour or any photographic elements, it will need to be produced as a printed vinyl which will then be contour-cut to remove the background, however if the design is complex, cutting may not be possible. But don’t worry, we handle the complicated stuff! You don’t need to get hung up on the best way to produce your custom wall sticker – just upload the design / logo / image you want to turn into a wall sticker and we’ll figure out the best way to produce it. The only thing you need to worry about is putting it up! Installation is easy and we provide full instructions with each wall sticker. Our custom wall stickers are as easy to remove as they are to install. For a perfectly clean removal, just warm the sticker a little with a hair dryer to make the adhesive tacky and peel away. 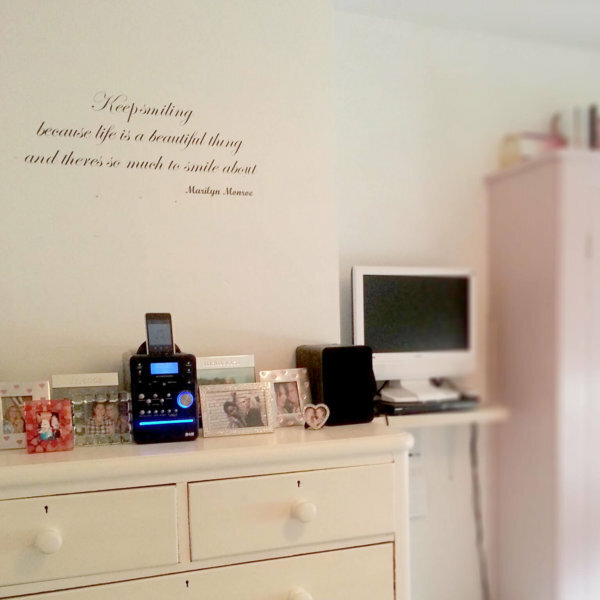 If you’re looking for a custom “quote” wall sticker, visit this page which includes a form for creating your own custom quote. If you’re looking to cover an entire wall with an image, then have a look at our custom wallpaper. If you don’t have a hard, smooth surface to stick the self adhesive vinyl to, have a look at some of our rigid signage, such as our foamex and dibond signs. Brilliant quality, excellent price and easy to stick to the wall. Really quick delivery too. Very impressed with the online service – it was easy to upload the artwork and order. Just what I was looking for! Fantastic quality product – our office vinyls and signs we made with some of them have been the envy of our neighbours and look really professional. Straightforward to apply (there is a knack to it, but you’ll get there) and very reasonably priced compared with having someone come and do these for you. Efficient service as product was delivered with 48 hours. Have already recommended you to a friend and will definitely be using your services again in the future. This product has gotten even better since I first ordered it, with a much better mount material; this makes the application of it to the wall much easier, and we continue to be really pleased with the results! Absolutely delighted with the speed of delivery and the quality of the sticker. It looks like it has been painted on our wall. Amazing customer service!!! I’m thrilled with the quality of my logo sticker, the super fast delivery and how easy was to upload the artwork online. Sure I’ll be back for more very soon. Excellent service and product, really pleased. Our custom made wall sticker looks great in our reception. so happy with my sticker. High quality and excellent service. ordering another one today! After I got over my nervousness about actually putting it up – it sat on my desk for a week or so – the sticker looked really great when it finally went on the wall. We’ve just expanded our office space so I’m going to order another one. Really fast delivery and turnaround for the custom logo and stickers that we ordered back in Jan for a trade event – they looked great! The end product was really great I can’t fault it but I felt a little mislead with the pricing. I went through the whole process thinking the total would be £12.59 for a custom designed 50cm x 50cm wall sticker and assumed the postage would be around £5. To my shock and horror when I got the checkout there was still VAT to be added (£4.90) and then a small order surcharge – which I’ve never heard of before (£2.41) and then postage was a whooping £9.40!!!! So the total ended up £29.40. I would have cancelled but I had spent 3 hours designing my wall art (originally I was going to order something already made but when I saw the price it tempted me to make my own being a Graphic Designer). I wish companies would be upfront about the cost of things at the start. Also, some instructions of how to put the stickers up with the sticker would be helpful. Luckily youtube had lots. But as I said the finished result was good. Overall very good. They made a mistake on the first sticker and once i contacted customer services, they were quick in sending out a replacement. Would order again as they sorted the problem, and the quality is very very good. Brilliant service and product. Thank you!!! Very pleased with our wall sticker. Good quality and fast turnaround. Happy overall with the product and result, cost was a tad high for such a small graphic. I ordered 2 custom wall stickers. Print quality was excellent and delivery swift. Only gripe I have, and the reason I have given 4 instead of 5, is that one of the stickers was creased when affixed to the protective backing paper. This made it a little harder to affix to the wall. Great quality and fast delivered. The whole design process was very easy and fully customizable, and I got what I wanted to get. I’d never ordered a vinyl before so had quite a few novice questions which the team were very quick to answer. The item was excellent quality and very easy to install on our wall. It looks amazing. We will definitely be ordering more after such a positive experience and quality product. I ordered a custom wall stickers. I was very satisfied of the very quick delivery and the great quality of the product. Hi Rob, apologies, you should have received printed instructions with your sticker. Thanks for the review though! We ordered a Custom Wall sticker of my wife company logo to go up on the wall at her new venture. I have to say it went up very easily and looks great. They send you a proof email first to confirm that it looks correct and the cut lines are in the right place. Print-2-media’s customer service was very good when we contacted them and are in fact looking to order another Vinyl from them soon. Great product. Easy to apply to wall. Looks perfect. V good quality and service. We needed to order a large sticker for an event, which was turned around very fast! Thoroughly impressed with the quality of finish. Will be using again! Perfect. Friendly service, an excellent product and super speedy delivery. I’d made a mistake with the design, which was spotted in the proof emailed to me and the Print 2 Media staff were really helpful and friendly while I rectified the mistake. Once they had the corrrect design it was printed and delivered very quickly and is a great quality product. I would definitely recommend Print 2 Media and hope to use their service again in the future.